eLearning Center, Bd. Vasile Parvan, no 2, Timisoara, Romania. The first day of the meeting started with the presentation on the current state of the OpenVM MOOC & OER both developed at the partner university Università Roma Tre. 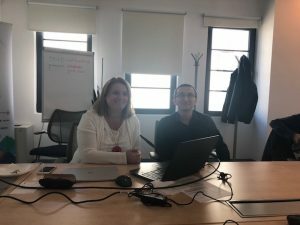 State of the art in O6 (including OER production/collecting existing OER, MOOC piloting planning, MOOC implementation) was presented by Francesco Agrusti & Francesca Amenduni (see pictures below). and Francesco Agrusti presenting the structure of the OpenVM MOOC comprised on 8 sub-MOOCs each dedicated to key OpenVM skills identified in the Group Concept Mapping in Output 1 (Framework). 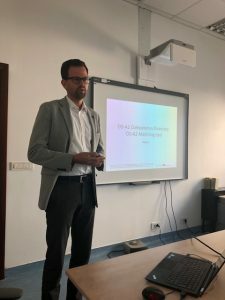 The presentation was followed by the discussion on the next steps and requirements for the OpenVM MOOC and production of OER in the OpenVM Learning Hub. 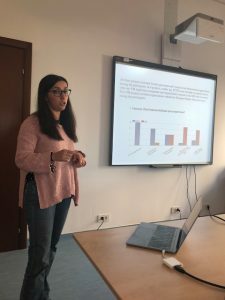 Our guest at the meeting – Carmen Holotescu – has provided us a lot of valuable feedback and proposed to integrate existing MOOCs into the OpenVM MOOC and use the OpenVM MOOC for teacher training, e. g. digital skills in open learning environments. The next point on the agenda was the presentation of the results in output O1 Framework. This included the present state of the art of OpenVM skills with references to the European competency framework ESCO (assisted by CINECA). The presentation was followed by discuss questions about competency framework and indicators for each of the eight key OpenVM skills identified in the Group Concept Mapping in Output 1. 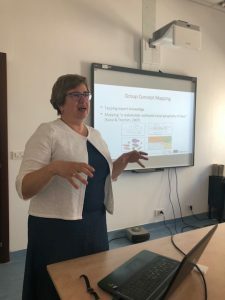 Olga Firssova from Open University NL presenting the final results of Group Concept Mapping (GCM) and the clusters of 8 OpenVM skills identified in Output 1 Framework. 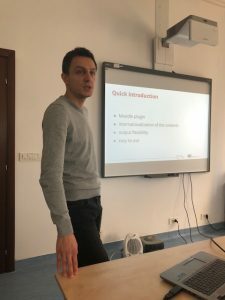 The next topic was the presentation about the current state in Output 2: OpenVM Learning Hub including the integration hub with bading system Bestr run by the OenVM parter organisation CINECA and e-assessment developed in Output 4. The key discussions were related to the integration of the badging system including OB issuing (xAPI) and OB reading (API), e-assessment tool integration as well as further requirements including the gamification concept developed Output 5. Diana Andone and Andrei Ternauciuc from Universitatea Politehnica Timişoara presenting the current state in the development of the OpenVM Learning Hub. Following the presentation about Output 2: OpenVM Learning Hub, Output 5 with focus on Open Credentials was presented, Ilona Buchem presented the design process of Open Credentials which has been based on the Design Thinking Methodology and the current design of the set of open credentials which will be used to recognise the 8 OpenVM identified in Output 1. Each credential type was described according to the generic design pattern (described in the DeLFI2018 research paper, see also slides in SlideShare). The key questions discussed with partner were: Which type of e-assessment is adequate for which of the 8 skills and how is it linked to issuing Open Credentials? How will the OpenVM Credentials represent the 8 OpenVM skills, e. g. at the level of main skills or at the level of sub-skills? How will levels be defined and represented by Open Badges? 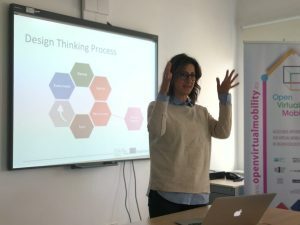 Ilona Buchem (Coordinator) from Beuth University of Applied Sciences Berlin presenting the Design Thinking Process used as a methodology to design the set of OpenVM Credentials based on the Open Badges Standard. The presentation and discussion on Open Credentials developed in Output 5 was followed by the presentation and discussion on e-assessment concept and tool developed in Output 4 (see pictured below). 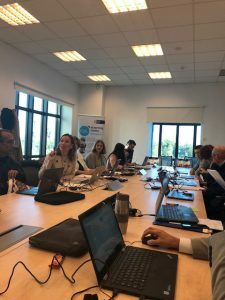 The discussions related to e-assessment revolved around the pro and contra for peer-assessment as well as the design of pre-MOOC and post-MOOC self-assessments. 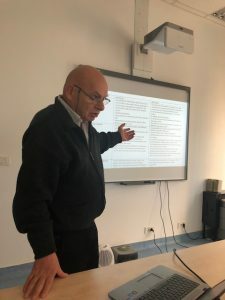 Gérard Casanova from the French Network of Universities AUNEGE presenting the e-assessment concept with items which will be used in e-assessment of the 8 OpenVM skills identified in Output 1. Pierre Duverneix presenting the e-assessment tool developed in Output 5 which will be integrated into the Learning Hub developed in Output 2. 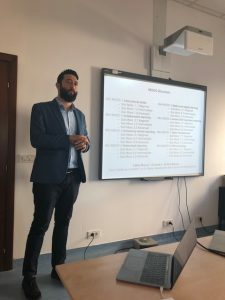 Day 2 of the 3rd project meeting started with the presentation about the current state of development in Output 3: Competency directory & matching tool. Discussions revolved around the applications of both the competency directory which will help reference the 8 OpenVM skills in OpenVM Credentials and the matching tool for group formation in the OpenVM MOOC, followed by the planing of next steps. Johannes Konert from Beuth University of Applied Sciences Berlin presenting the competency directory and the matching tool developed in Output 4. The presentation on the competency directory and the matching tool was followed by the presentation and discussion about Output 7: Quality, Dissemination, Sustainability including the presentation of current publications and events in the OpenVM project, results of the online survey on Self-Regulated Learning, the final version of templates for documents which will be used to publish project Outputs as well as next steps and requirements for the Sustainability Plan. Output 7 was presented by Gemma Tur from Universitat de les Illes Balears. 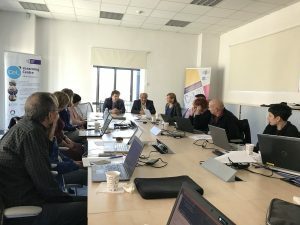 The final point on the agenda was presented by Ilona Buchem (Coordinator) and was dedicated to Administration and Project Management and focused on preparing documents for the interim report in January 2019, publishing project outputs according to the Timeline of Activities, demonstration of the Mobility Tool (interim report) and information about the preparations for Quality Gate 2. The project finished with a visit from the rector of Universitatea Politehnica Timişoara who expressed the interest of Universitatea Politehnica Timişoara in the partnership and the outcomes of the Open Virtual Mobility project and promoting Virtual Mobility altogether. Rector of Universitatea Politehnica Timişoara at the closing of the 3rd OpenVM Transnational Project Meeting in Timisoara.